Merchants can accept ApplePay payments both in a retail environment and in a customer facing environment such as a website or iOS mobile application. For retail applications, merchant will need to use an Apple Pay compatible NFC capable payment terminal. More information on retail solutions can be found at https://usaepay.info/. Developers can also take advantage of the Payment Engine framework for easily supporting retail payment terminals which include ApplePay support. When complete you can use our Client JS library to add the Apple Pay button to your website. 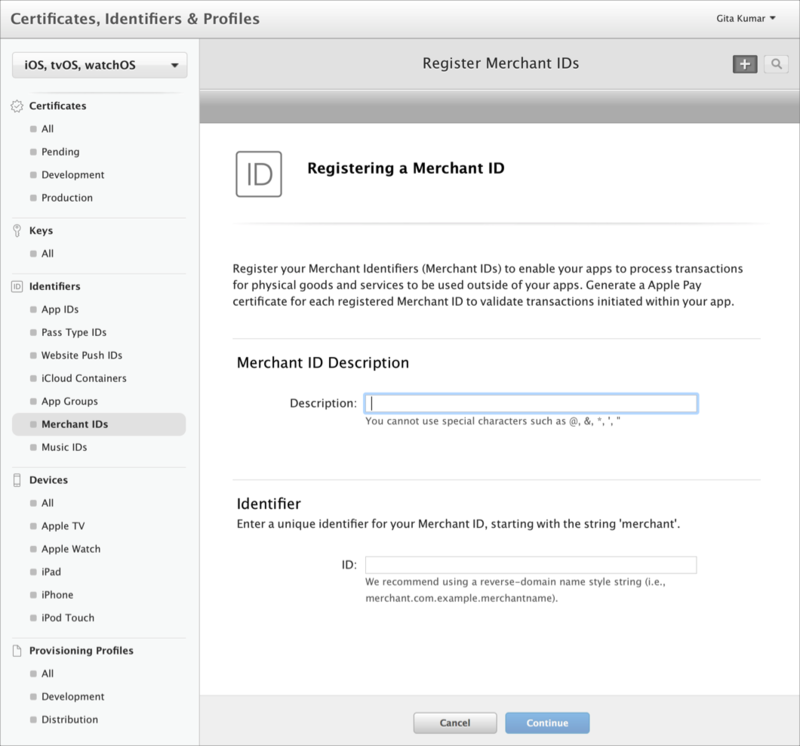 You will need to configure a Merchant ID within the Apple Developer website. First you will need to generate a Certificate Signing Request (CSR) in the merchant's gateway settings. Login to the merchant account, go to the ApplePay section of the the Settings tab. Click "Certificate Signing Request" to download the signing request to your computer. Once you have downloaded the request, login to your Apple Developer account and follow the instructions found here to create the payment processing certificate. 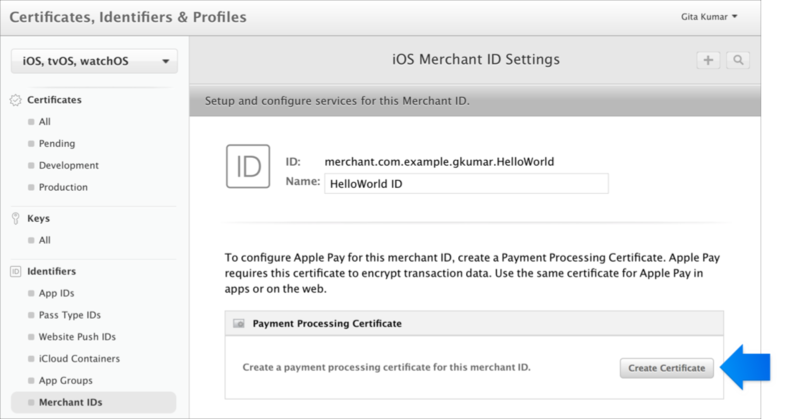 Once the certificate has been created in the Apple developer portal, download it and return to the Apple Pay section of the merchant settings. 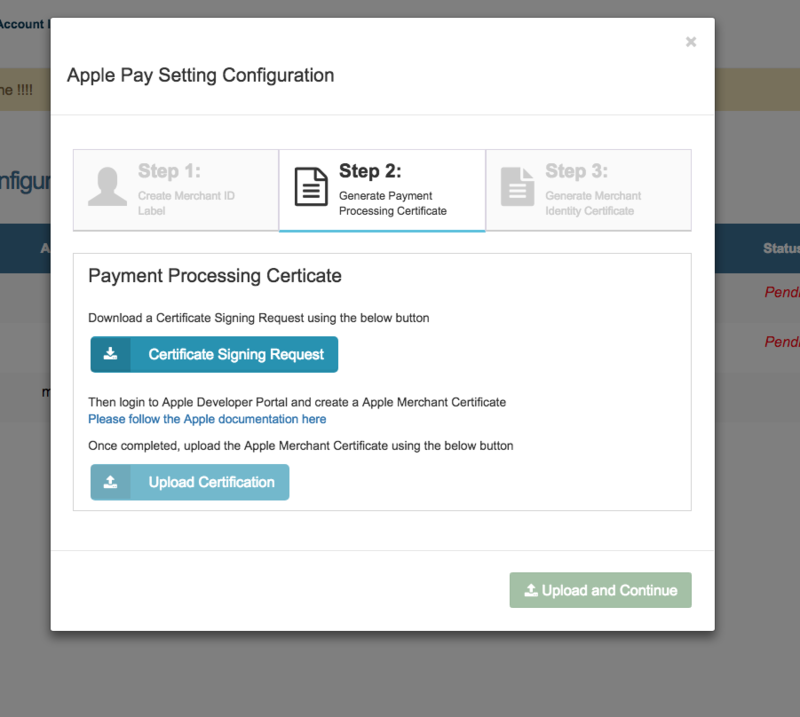 Next, upload the Payment Processing certificate you received from Apple to your merchant settings. Click the "Upload Certificate" button, select the certificate from your finder, and confirm. Once the certificate has been uploaded, click "Upload and Continue". The next step is to register your website domains. You will need to enter all domains where you plan to display the Apple Pay button for this merchant identifier. This includes top level domains and subdomains. This is also done within the Apple Developer website. Next, you repeat almost exactly the same steps as the Processing Certificate for the Merchant Identity Certificate. 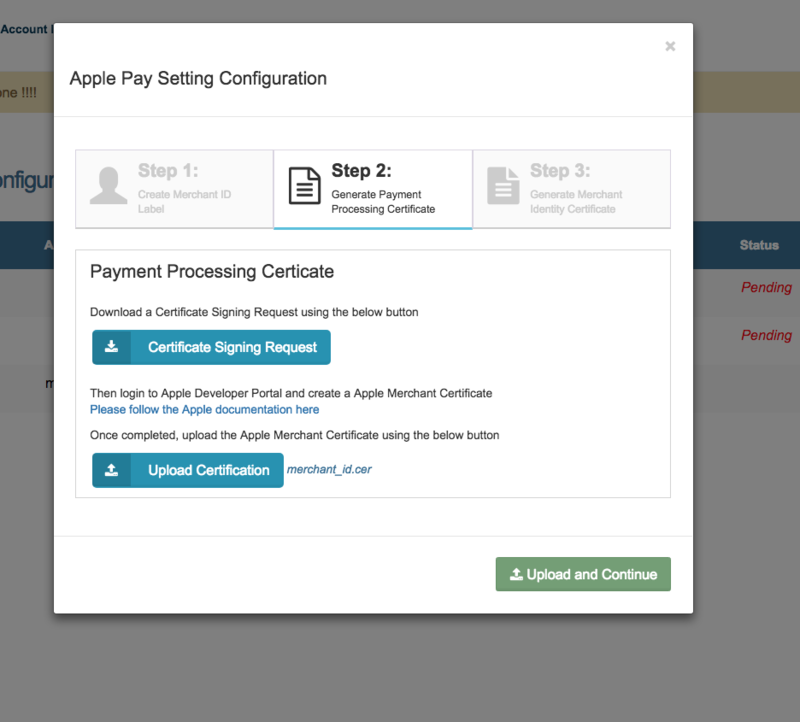 Click "Certificate Signing Request" in "Step 3" of the Apple Pay Configuration to download the signing request to your computer. 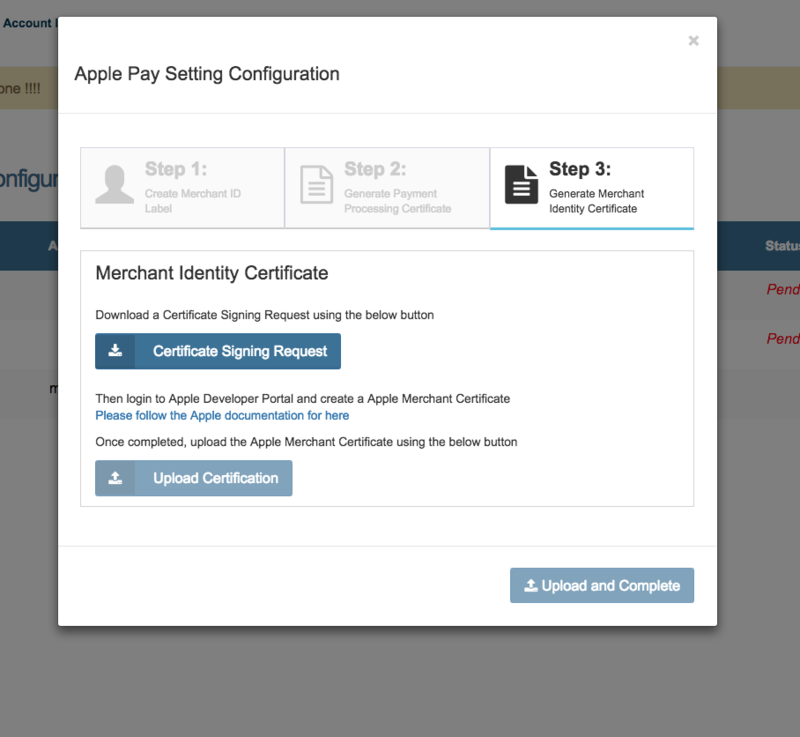 Upload the Merchant Identity certificate you receive from Apple to the same Apple Pay Configuration in the ApplePay section of the the Settings tab of the merchant account and click "Upload and Complete". Your Apple Pay is now configured!